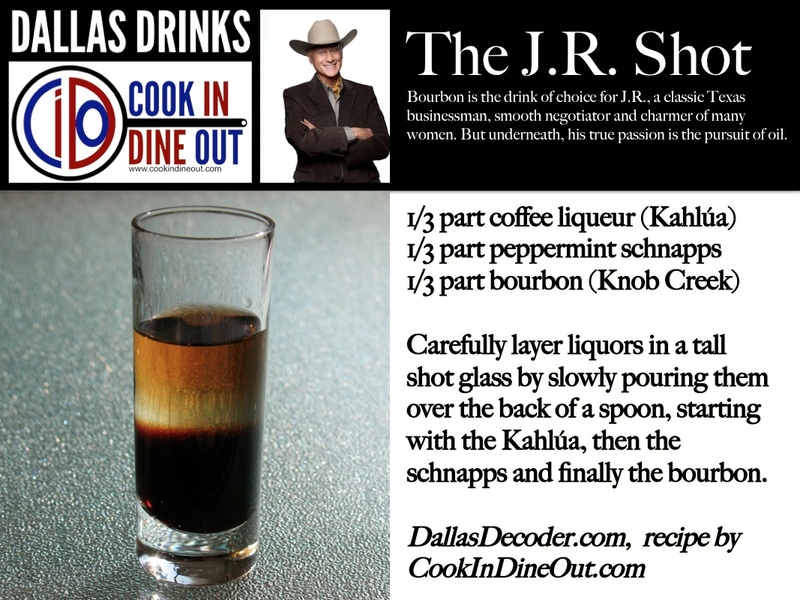 Dallas Drinks is a co-creation with Dallas Decoder, honoring the characters of the new TNT drama Dallas, which continues the Ewing family saga. See all of the Dallas Drinks here. "Who Shot J.R.?" is the most classic of Dallas story lines. It was the cliffhanger arc between the third season finale and the beginning of the fourth season. Dallas' ratings were never higher, and speculation over the identity of the unseen shooter fueled a level of watercooler buzz shows would kill for these days. Of course J.R.'s signature drink has to be a shot. I started with bourbon, which Dallas has established is J.R.'s drink of choice. I also wanted something to represent oil, for which Kahlúa is perfect, not only because of its dark color, but its higher density makes it sink to the bottom of a layered drink, evoking the underground deposits of oil J.R.'s ambition is to exploit. Peppermint schnapps forms a refreshing middle layer between the two--the buffer that unites J.R.'s southern roots with his single-minded business sense for oil. His way as a smooth operator has made J.R. a success in the board room and the bedroom. This is much more interesting than bourbon and branch, J.R.'s signature drink on the old show. Thanks for inventing it, dear.